Can your entire way of looking at something can change forever in just one moment? While my friend and I chatted over the phone, a sleek, black feline stealthily approached the bird feeder hanging outside my dining room window. The two and a half foot feeder hung from a wire I had strung between my back door and a sturdy oak tree. Wrapped lovingly around the feeder was a large gray squirrel, its face shoved into the corn and seeds. The cat came closer and closer. The squirrel seemed oblivious to approaching danger as it inhaled large mouthfuls of food. Finally the cat sprang upward to grab the squirrel, who scurried up the feeder to the wire. Balanced like an acrobat in the circus, the squirrel looked down at the cat and waved its tail in defiance. 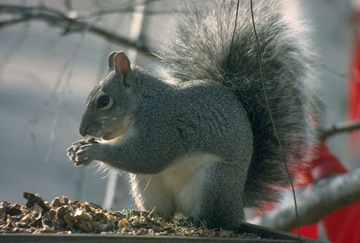 “Leave my squirrel alone, “ I shouted telepathically, so as not to deafen my friend on the other end of the phone line. The cat, who had walked several feet away from the feeder, stopped walking. It turned and came quite deliberately towards the window where I stood looking out, the phone against my ear. The cat stopped right beneath the window and looking directly into my eyes, said “That is NOT your squirrel.” Then it turned on its heels and strode away. “Yes,” I reminded myself. “That, in fact, is not anyone’s squirrel. The squirrel belongs to itself.” The cat had reminded me that all animals are sentient: conscious, self-aware beings. We cannot own them any more than we can own another human. About 7 years ago, I recognized that my life-long abilities to communicate telepathically with animals were quite real. This changed my understanding of human/animal relationships at a very deep level. The animals teach that each animal’s life has special purpose and meaning, and that it is not up to the humans in their lives to determine their purpose for them. Furthermore, I now understand that animals are on the Earth as our partners, rather than as our servants. Every species is part of the “web of life”, to quote the Native American known as Chief Seattle. As a professional Animal Communicator or "pet psychic", I am called on daily to help people and their animal companions with a wide variety of situations. Sometimes an animal is very ill and the person wants to know how it feels about various treatment plans or about euthanasia. I may be asked to help the human and/or the animals accept a new family member, or to deal with the loss of an animal companion. Sometimes the human is concerned about an animal’s unusual behaviors and wants to understand or to bring about changes in those behaviors. In other cases, human and animal may participate in show competitions and the human wants help to improve their ability to work together as a team. These are only a few reasons why people consult with me. For those who believe in the so-called objective or behavioral psychology mode of thinking about animals, telepathic communication with animals may seem like a fantasy. However, if you feel emotionally close with your animal family member, you may also experience a bond, a connection and an understanding, that defies logic. Comparative psychology to this day discusses observable behavior and physical states of animals, and evolutionary explanations for their existence, but shies away from the mental states that are inextricably involved in that behavior... Although many scientists have believed that the animals they observed had emotions, few have written about it. This is because for many decades it was unacceptable to do so. Yet what my communication with animals has repeatedly shown me is that the so called “human emotions” are not limited to humans at all, but are shared throughout the animal kingdom. As an empath, one who can feel emotionally what others are feeling, I know that this is true from my own direct experience. Do you have any memories from childhood (or even as an adult) of connecting with an animal in a special way so that you felt you knew what the animal was thinking and/or feeling? Did the animal seem to converse with you, to share its perception of life? Have you ever felt you could see the world through the animal’s eyes? Have you ever imagined that you were a specific animal or species and felt what is it like to be in their body? In my workshops on telepathic communication with animals, I help participants remember how to make this connection. Once you’ve made it, your perceptions of yourself and your animal friends will be changed in ways that affect your values, your beliefs, and how you choose to live your life here on planet Earth. Graphics and logo design by Natasha Rethke. Send mail to neddaw@sbcglobal.net with questions or comments about this web site.